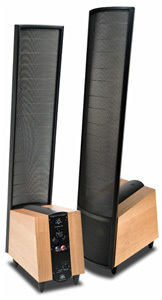 Howard said: The Summit X is the latest step in MartinLogan’s ongoing quest for electrostatic perfection. They’ve improved on the technology’s stunning strengths -- transparency, speed, immediacy, midrange presence, soundstaging -- while minimizing its shortcomings, particularly in the integration of the outputs of the woofers and upper-range panels. The gist: X marks the sweet spot.